Lexus has just unveiled the 2013 Lexus GS 250 sedan for Europe at the Guangzhou Motor Show in China. While the U.S. is focused intently on the 2011 Los Angeles Auto Show, another car show is going on in the Far East. The Guangzhou Motor Show is currently running in China, and Lexus has used the event to unveil their Euro-spec 2013 Lexus GS 250. 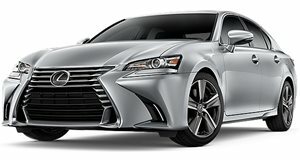 Set for sale next summer, the GS 250 sedan features a 2.5-liter V6 with direct injection that puts out 206hp and 186 lb-ft of torque. The fairly-efficient engine returns 31.7mpg UK (or 26.4mpg U.S.) and has C02 emissions measuring 207g/km. It is mated to a six-speed automatic transmission. The sedan can move from 0-62mph in 8.6 seconds and can hit a top speed of 142mph. The 2013 Lexus GS 250 will launch in the UK in June 2012. No diesel variant is available, however a high-performance GS-F model is currently in development.